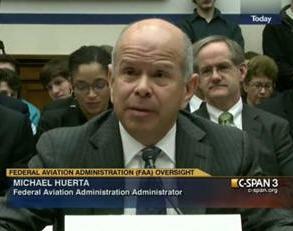 April 17, 2013 - Senate Committee on Commerce, Science, and Transportation Ranking Member John Thune (R-SD) questioned Federal Aviation Administration (FAA) Administrator Michael Huerta during yesterday’s “Aviation Safety: FAA’s Progress on Key Safety Initiatives” hearing. Over the last few months, Thune, along with House Committee on Transportation and Infrastructure Chairman Bill Shuster (R-PA), have been requesting information from the U.S. Department of Transportation (DOT) and FAA regarding the administration’s plans to safely implement the sequester without unnecessarily disrupting or inflicting pain on airspace users. While Department of Transportation Secretary Ray LaHood and Administrator Huerta have claimed that none of their actions would affect safety, National Transportation Safety Board Chairman Deborah Hersman acknowledged concern that the closure of 149 contract towers could eliminate redundancy that is the hallmark of aviation safety. In addition, after weeks of claims by Secretary LaHood and Administrator Huerta that the Administration has no flexibility in the implementation of the spending reductions, Administrator Huerta walked back claims under direct questioning on the issue by Ranking Member Thune at the hearing. Administrator Huerta admitted that the FAA has the flexibility under current law to transfer up to two percent of funding from one activity to another without Congressional action. Also, under direct questioning, Administrator Huerta admitted the FAA has the authority to request reprogramming of funds which could lessen the safety impact of certain sequestration cuts that the FAA is currently working to implement. Last week, Chairman John D. (Jay) Rockefeller IV (D-W.Va.) and Ranking Member Thune sent a letter to the DOT asking that the agency implement sequestration cuts using lower priority spending rather than close air traffic control towers across the country due to unanswered safety concerns. They were joined on the letter by Senate Aviation Subcommittee Chairwoman Maria Cantwell (D-Wash.) and Ranking Member Kelly Ayotte (R-N.H.), as well as Representatives Shuster, Nick Rahall (D-W.Va.), and Frank LoBiondo (R-N.J.). Senator Thune also pressed the FAA regarding the important Pilot Qualifications rulemaking required by Congress in the wake of the tragic loss of life related to Colgan flight 3407. Under questioning by Senator Thune, Administrator Huerta assured the Committee that the FAA would publish a final rule on Pilot Qualifications before August 1, 2013, including provisions giving pilots credit for flight hours earned through advanced training and military service. “This is an important rulemaking for the agency to complete on time, and as Congress intended,” said Thune.